Is Bigfoot Mueller’s Missing Link? 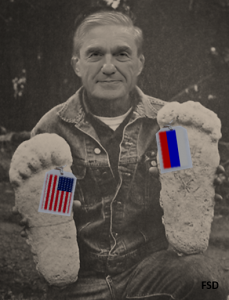 In an astonishing and defining moment both for cryptozoology and the Russian Collusion narrative, Independent Counsel Robert Mueller revealed today that massive hominid footprints discovered outside both Trump Tower and the Kremlin originate from the same primate species, if not the same individual. Is Putin directly implicated in this scheme? What about the recent revelations that your Russian troll indictment was lifted, whole-cloth, from a 2015 Radio Free Europe Ukranian article? Are in-house plagiarism indictments forthcoming? Do you have any comment on President Trump’s latest tweets and do you plan to explore his “400 pound genius sitting in bed and playing with his computer” theory? What about the President’s suspicion ‘they’re laughing their asses off in Moscow’? How does he know they’re laughing and when did he know it? Can we get a phone number, please? Can we get a clue? This article was posted on Tuesday, February 20th, 2018 at 4:44pm and is filed under Donald Trump, Fake News, Media, Russia, Satire, Ukraine.